Freight rates for 9-tonne pay load section to Mumbai, Pune rose by INR 1,000 in local truck transport market today following. 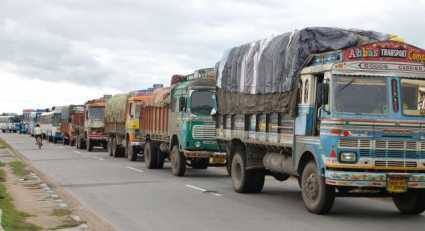 Transporters said less availability of trucks against increased cargo movements, mainly pushed up Pune, Mumbai rates. Delhi to Mumbai and Pune freight rates moved up by INR 1000 each to INR 27,000 and INR 28,000. Jaipur-14,000, Hyderabad-54,000, Chandigarh-16,000, Vijayawada-57,000, Ludhiana-17,000 Bangalore-64,000, Kanpur-18,000, Chennai-63,000, Indore-18,000, Mysore-69,000, Ahmedabad-19,000, Pondicherry-64,000, Baroda-23,000, Coimbatore-67,000, Patna-25,000, Kochi-73,000, Surat-25,000, Thiruvananthapuram-77,000, Mumbai-27,000, Goa-49,000, Pune-28,000, Gwalior-13,500 Kolkata-28,000, Guwahati-51,000.